Its Tuesday again!! Inspiration Tuesday!! Here are the photos of the week that have inspired me!! Enjoy gorgeous people! I love this saying....its really sad to see and hear of people trying to change to please someone, or to stop the bullying or to feel what they believe is right. Each person is beautiful in there own way, beauty comes from within and each of us is unique. When I think of my friends or people I have encountered who put there stamp on me, I see them as beautiful for how they have or do treat me. People dont get through life through beacause of there face or figure, they get through it by who they are inside. 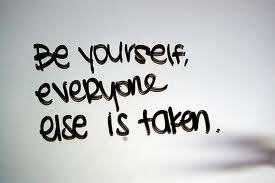 Always stay true to you and know that what makes you beautiful is who you are. 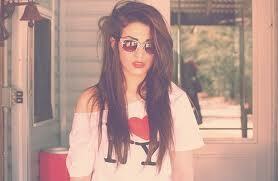 Loving the chilled out look in this photo....i used to have a I love NY t-shirt and loved it! I miss it!! Funky kitchens get me everytime! 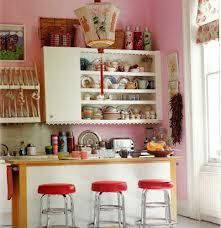 I really want a plate rack like in this photo and how awesome is that wall unit!! A great way to display all the china! Dont think I need to expand on this....life is too short to not do something because of fear...let go and have fun, you might regret it otherwise. 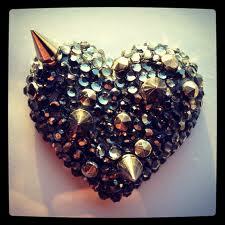 You might be getting sick of tired of my love for all things studs and spikes!! But wow what a gem this is!! LOVE LOVE LOVE! Finally! Wish I was creative and able to achieve nails like these! 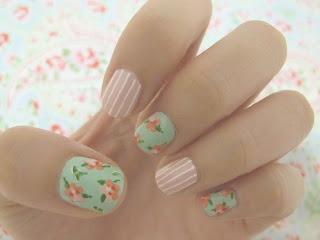 They are stunning, very Cath Kitson! The detail is so thought of and precise. Lovely pictures! I wish I could do those nails too! Unfortunately I don't have such a steady hand..